William Le Queux (1864 - 1927) was an Anglo-French journalist and writer, diplomat, traveller, flying buff and wireless pioneer who broadcast music from his own station long before radio was generally available. He was phenomenally successful as a novelist and short story writer, and many of his tales are based on his own exploits, albeit vastly exaggerated. He is widely recongnized as one of the first creators of the spy story genre, in which his diplomatic background, familiarity with European high society and his interest in technology combined to create a rich tapestry for his intrigues. 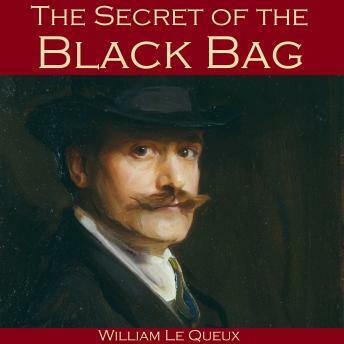 The Secret of the Black Bag is a classic secret service mission in which he travels to Brussels in an urgent race to outwit the French and secure the secret plans to a mysterious new weapon.